TNPSC Group 2 Exam Application Form 2018 Apply Online: Tamil Nadu Public Service Commission (TNPSC) has rolled out the notification for Group 2 posts. TNPSC inviting applications from the eligible and interested candidates. Hence hopefuls aiming to get the Tamil Nadu State Government jobs can start applying and the last date to apply for the TNPSC Group II posts is 9th September 2018. Aspirants who wish to apply for TNPSC Group 2 posts can refer the notification clearly for all details. Candidates interested to apply for Group 2 posts can apply through TNPSC official website, tnpsc.gov.in. Hopefuls seeking to check more details such as eligibility criteria, application process, selection process, pay scale and other details can go through the article. TNPSC Group 2 Recruitment 2018 :Tamil Nadu Public Service Commission is the Tamil Nadu state’s functional authority that recruits manpower for various associated organizations of it. Annually the organization releases notifications for various posts. This year TSPSC notified 1199 Group 2 Posts. The vacancies include Sub-registrar, probation officer (prisons department and social defense department) posts. Aspirants having the educational qualification of Graduate Degree with good pass percentage can apply for TNPSC Group 2 posts. The age limit varies as per the designation announced. Aspirants can look down for the clear details of TNPSC Group 2 eligibility criteria. The application process was already started on 10th August and ends on 9th September. While the last date to pay the application fee is 11th September. Hence candidates can hurry up and apply for the posts. The TNPSC will organize the preliminary examination, mains examination, and interview rounds to select the suitable aspirants. Candidates finally shortlisted for TNPSC Group II posts can get good pay scale as per norms. Here in this article, we have mentioned much information about TNPSC Group II notification 2018 for the reference of aspirants. For Industrial Co-Operative Officer in the Industries and Commerce Department A Degree of B.Com or B.A., or B.Sc. For Probation Officer in Social Defence Department A degree of B.Sc., or B.A., or B.Com., of any University or Institution, recognized by the University Grants Commission. (OR) B.O.L., of Annamalai University (OR) B.B.A., of Madurai Kamarajar University or B.Litt., of Madras University or B.B.M., or B. Litt., of Bharathiyar University. For Sub-Registrar Grade- II Posts: Minimum – 20 Years & Maximum – 30 Years. For all posts (Except Sub-Registrar Grade–II, Probation Officer in Prison Department and Social Defence Department): Minimum – 18 Years & Maximum – 30 Years. 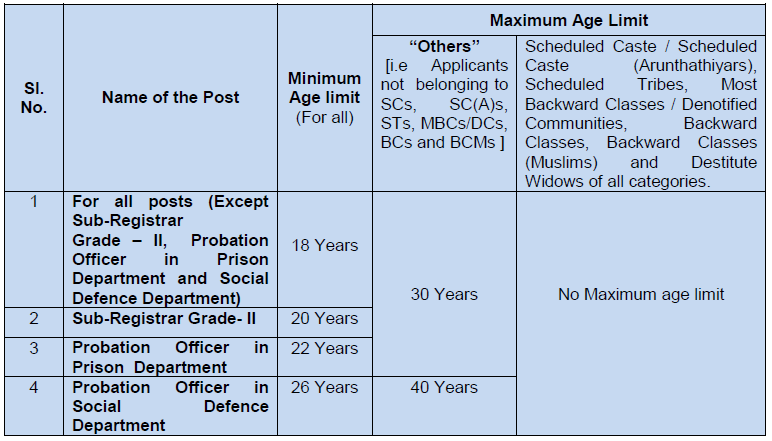 For Probation Officer in Social Defence Department: Minimum – 26 Years & Maximum – 40 Years. Probation Officer in Prison Department: Minimum – 22 Years & Maximum – 30 Years. Applicants should possess the following or its equivalent qualification awarded by any University or Institution recognized by the University Grants Commission or the State Board, as the case may be. Applicants who have already registered in One Time Registration system within the validity period of five years are exempted. The Examination fee should be paid at the time of submitting the online application for this recruitment if they are not eligible for the fee concession noted below Notification. Interested and eligible aspirants can apply through online on TNPSC official website, tnpsc.gov.in. candidates have to pay the requisite application fee through online using any debit/credit cards. Candidates can apply from 10th August to 9th September 2018.